Tomosynthesis, sometimes called a 3-D mammogram, allows the breast to be viewed as several thin slices that run through the entire thickness of the breast from one skin surface to the other. Lehigh Valley Health Network was the first hospital in the region to offer this advanced diagnostic tool. It gives radiologists the ability to view the breast layer by layer, helping to see fine details more clearly by minimizing overlapping tissue. During a 3-D mammogram, multiple images of the breast are acquired at different angles. Tomosynthesis may be especially helpful for women with dense breast tissue (category 3 and 4) as well as women with significantly increased risk for breast cancer, and may allow the radiologist to detect smaller lesions or ones that might be hidden in dense breast tissue. Earlier detection: Being able to examine the 3-D mammography images individually can minimize the impact of overlapping breast tissue, thus improving early breast cancer detection. Fewer callbacks: 3-D mammography helps distinguish harmless abnormalities from real cancers, leading to fewer callbacks and less anxiety for women. Better visualization: Radiologists can better see the size, shape and location of an abnormality. To bring you even more comprehensive care, LVHN’s Breast Health Services now utilizes technology from Hologic that eliminates the need for additional X-ray exposure to acquire a 2-D image. C-View™ (by Hologic) creates a traditional 2-D image from 3-D data points. This change eliminates the need for extra 2-D X-ray exposure to capture the same image. No referral is necessary for either your annual (standard 2-D) screening mammogram or the 3-D mammogram. Tomosynthesis is an optional service at this time and elected by the patient. The 3-D exam is performed at the same time as the regular mammogram. It will take about 2-4 seconds longer in compression per view. The entire exam takes approximately the same time as that of your regular digital mammogram. Please check with your individual insurance provider for coverage. Coverage varies with each insurance plan. 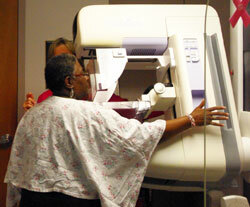 Click here to see a list of locations where 3D mammography is available. For more information or to schedule an appointment, call 888-402-LVHN.